Writer/Blogger, aspiring published author Can usually be found on the floor with my two boys laughing, photographing something or dragging home furniture to up cycle. 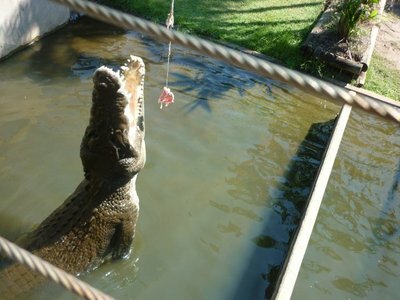 For a great up close and personal crocodile experience in the NT check out Crocodylus Park. A scientific research centre and working crocodile farm set up like a mini zoo, Crocodylus is a must see for the family with over 10,000 crocodiles big and small in residence. Being only minutes from Darwin Airport and 15 minutes from the city on McMillans Road, Crocodylus is a great opportunity to get close to big crocs without travelling out past the rural area. Prices start at $35 for an adult, $17.50 for children over three and $26 for seniors. Children under three are free. Family passes are also available. Tours run every day except Christmas Day at 10:00am, 12:00pm, 2:00pm and 3:30pm. The set up of the park is really orientation friendly and being only a small park, you can see everything in half a day. While living in the Territory, every family and friend who came to visit was taken here, and even when they returned to visit me again, they often asked to go back as they had enjoyed the experience so much! Your tour starts off at the lagoon full of Saltwater Crocodiles, where a pulley rope of meat is sent out to the middle of the lagoon and you can watch from the platform as the crocs jump for their dinner. From here, the tour continues to where you can feed your own giant crocodile in one of the breeding pens. All ages can try this, but even I was nervous trying it. The thud that sounds when the croc snaps his jaws at the piece of meat, is a sound to make anyone shudder a little. Depending on the size of the group travelling through, in my experience, most people who want to manage to have a turn at feeding one of the many crocs in the breeding pens get a chance. You can always tag along on the next tour for the feeding part, so make sure you get a turn and then break off and go back to wandering around the park. Next you continue on to the juvenile pens including some freshwater crocs for comparison to the salties. The babies are absolutely gorgeous each with individual patterns on their skins. All the guides are very knowledgeable and also provide an entertaining commentary as you walk along on the feeding tour. The tour concludes with a baby saltwater croc being brought out for you to hold and have your photo with. A perfect snapshot to show the family. You can then at your own leisure, wander through the park at your own pace and check out the various animals including a tiger, lions monkeys and some Australian natives. Also make sure you find time to visit the Crocodylus Museum inside and check out all the skins and history of crocodile farming. I found the most interesting parts to be the various news articles on crocs that have been caught around Australia and the Islands including Papua New Guinea. •	Wear walking shoes there is lots to see. •	Camera to take photos of you holding a baby saltie, plus of course anything else you want to photograph. •	Credit card with a high credit limit-Those crocodile skin handbags and wallets inside the shop are mighty tempting. •	Slip Slop Slap! There is not a lot of shade around the pens and southerners will feel the heat particularly if visiting in the wet season of around November/December - April as it gets quite humid. 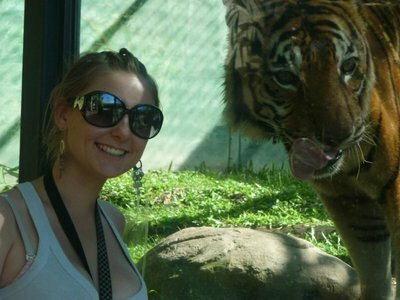 I totally recommend this park as a must see for the Northern Territory experience. The guides will also be able to advise on what areas are safe to go to and swim and have good local knowledge to share. Try it out today. Why? 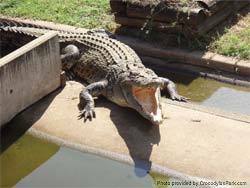 A scientific research centre and working crocodile farm set up like a mini zoo, Crocodylus is a must see for the family with over 10,000 crocodiles big and small in residence.